27th March 2014 Abu Khadeejah Abdul-Wahid Health Comments Off on Depressed? Mood Swings? Feeling Down? Is There an Alternative To Antidepressants? For everyone “knows” that vitamins do not cure “real” diseases, right? But the truth will out eventually. Here is an example of how niacin can really help: One patient, a bona fide, properly-diagnosed, utterly-incurable, State-hospitalized schizophrenic patient, would not see niacin work in the hospital, of course. No, the patient was a fellow whose parents were desperate enough try anything, even nutrition. Perhaps this was because their son was so unmanageably violent that he was kicked out of the asylum and sent to live with them. On a good day, his Mom and Dad somehow got him to take 3,000 milligrams of niacin and 10,000 mg of vitamin C. Formally a hyperactive insomniac, he responded by sleeping for 18 hours the first night and becoming surprisingly normal within days. It was an astounding improvement. And what about that “niacin flush”? 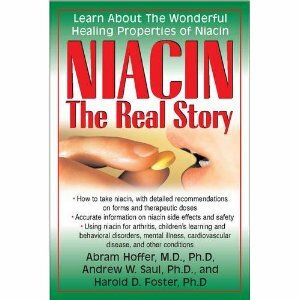 In Niacin: The Real Story, Dr. Hoffer clearly presents the practical details of niacin treatment. Inevitable physician skepticism, and questions about niacin’s proven safety and effectiveness, are thoroughly addressed in this book. This is NOT a biochemistry textbook, however. Let’s be honest: to most of us, that is a relief. But when even a basic working knowledge of niacin can profoundly change so many patients for the better, this vitamin becomes very interesting very quickly. Dr. Hoffer treated thousands and thousands of such patients for over half a century. He saw medical fads come and go. What he focused on is what he’s always seen: very sick people get well on vitamin B-3. Niacin: The Real Story is Dr. Hoffer’s final, ultimate work. In it, he tells you, in detail, exactly how to use it to get results.